“A complete package” is how purchaser Colleen Smith describes the top-priced bull at the Highlands Droughtmaster sale on Friday, which she and husband David secured for their Vale View Droughtmaster stud for $24,000. The 24-month-old son of Oasis Dollar and Oasis A Miss Sunshine was carrying 845kg, had an EMA of 127 square cm, and a scrotal circumference of 38cm. Third in the judging undertaken prior to the sale, Colleen said they were impressed with the power and scale of their new sire.“He was a true standout on the day – we feel we were very lucky to secure him at that price,” she said. 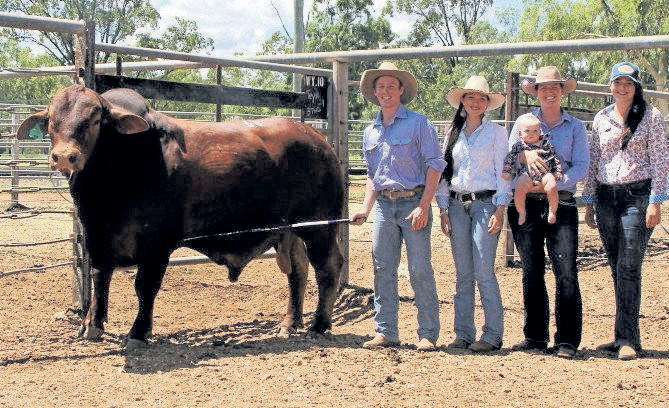 The Geddes family sold all four of their Oasis stud bulls at the Clermont venue for an average of $11,250. Second top price paid was $20,000, by the Finger family, Dysart, for Strathfield 9JE Irresistable, a 28-month-old bull sired by Glenau-byn Detroit out of Strathfield Sunglow. Spokeswoman, Lauren Finger, La Shae Drought-masters, said his EMA of 125sqcm impressed, along with his structure and temperament. 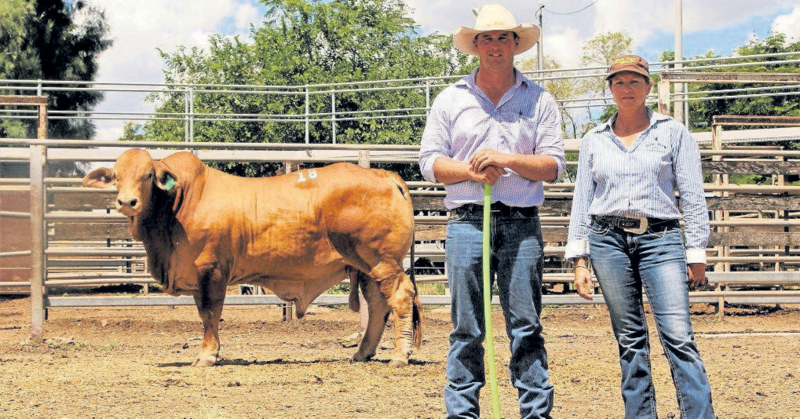 “We’ve bought Strathfield bulls before – they go well over our cattle and stand out in our country,” she said. Irresistable will become a new herd sire and will be shared with the family’s wider commercial herd. Vendor, Josh Perry, said it had been an outstanding result, coming on top of a first placing in the morning’s judging. “They were the first sons of Detroit sold at auction so we were interested in seeing how they went,” he said. It added up to a $10,250 average for the bulls sold on Josh’s behalf and a $9142 average for the stud overall. Second place in the judging went to Karragarra Stud, which sold all 10 bulls offered for a $9350 average. Their top price was $18,000 for Karragarra Norvin, a son of Glenlands Quill, which was purchased by Pioneer Grazing Co, Clermont. Norvin’s statistics included a weight of 805kg, an EMA of 130sqcm, and a scrotal circumference of 46.5cm. Also selling for $18,000 was Mt Oscar Paul, to Alan Williams, Riverside Pastoral Co, Nebo, helping the stud to a $9166 average. Lot 77, Huntly 518, purchased by Redskin Droughtmaster, Morinish, for $14,000, was the top-priced herd bull of the sale. Top-priced bull at the Highlands Droughtmaster sale, Oasis A Mr Mint, with vendor Adam Geddes, and purchaser, Colleen Smith, Vale View Stud, Manumbar. Strathfield 9JE Irresistable and owner, Josh Perry, with purchasers Lauren, Becky, Pippa and Tamara Finger. 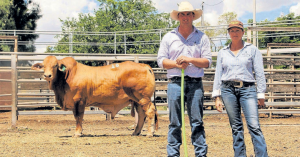 Jumba Holdings, Charters Towers, was one of the volume buyers on the day, taking home six bulls, from Oasis, Karragarra, Redskin and Huntly studs. Also active in the sale ring were Andrew and Sam Bulger, Serento, The Willows, filling their truck with six bulls from Medway, Amalfi, Warrina, Strathfield and Mt Oscar studs. Selling agent, Brian Wedemeyer, Elders, said while the sale was down from last years’ red hot $8683 average, it was a very pleasing result. “There are still some dry patches and it doesn’t rain instant breeders,” he said. Some $8500 was raised for the Clermont Kindy and Daycare, thanks to each stud donating 10 percent of the proceeds of one of their bulls to a cause. On the Thursday evening, at the meet and greet, auction items donated by the Clermont community raised $8150 for Tie Up the Black Dog. Highlands Droughtmaster secretary, Alex Donaldson, said it was only the second time the auction had been held but it was already a popular event.